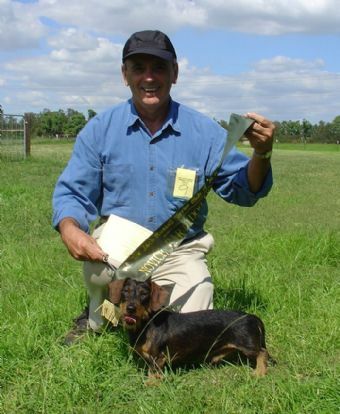 Welly was the 2005 Miniature Wirehaired Dachshund Point Score Winner, Dachshund Club of NSW, and in 2007, became the first of his breed in Australia to attain an Earthdog Title. 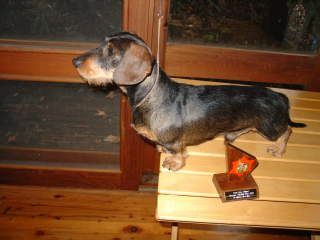 He attained his Senior Earthdog Title on 11/10/2009 at the Ist Earthdog Tests conducted by the Dachshund Club of NSW Inc.
His correct size, superb wire coat, friendly and outgoing temperament and unique combination of English, American and Australian bloodlines made him a popular stud dog and he sired puppies of outstanding quality. Tarrangower is a Celtic word meaning "place on a craggy hill". Ours at Palm Beach, Sydney, has an abundance of natural beauty and wildlife - including ticks. 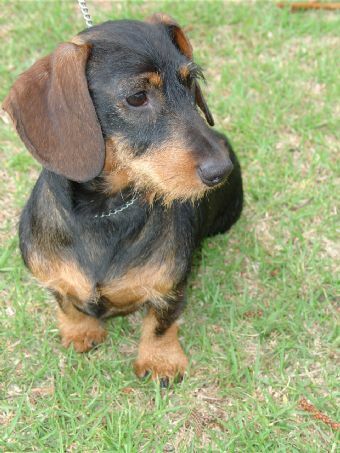 In the twenty years that we have shared our abode with a Dachshund or two, we have learned to live with them. We were absolutely devasted when we lost Welly to one. It had lodged on his gums, hidden by his whiskers.